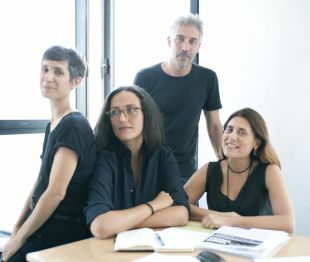 In designing the Israeli pavilion at the 2018 Venice Architecture Biennale, which opened on Saturday, curators Tania Coen-Uzzielli, Deborah Pinto Fdeda, Ifat Finkelman and Oren Sagiv succeeded in dealing with the most complicated loci of the Israeli-Palestinian conflict in a manner that is almost impartial. Under the headline “In Statu Quo: Architecture of Negotiation,” they chose five sites in Israel and the West Bank that are sacred to Jews, Christians and Moslems alike, viewing them through the prism of the status quo. The status quo in this context is a type of ad hoc protocol that defines in detail the way a holy site is to be used over time, in a way that is not subject to the changing prevailing political situation. Each site was given a different definition/heading at the show, among them choreography, project, scene and landscape. The curators have managed to depict the Israeli-Palestinian conflict using a perspective we haven’t seen before, in a complex and difficult way, but also with some optimism. The result is courageous, down-to-earth and aesthetic. The sites she and her colleagues selected are, in the Old City of Jerusalem, the Church of the Holy Sepulchre, the Western Wall and the Mughrabi bridge leading to the Temple Mount; in Bethlehem, the Tomb of Rachel; and in Hebron, the Tomb of the Patriarchs. The entrance floor of the Israel pavilion is dedicated to the Church of the Holy Sepulcher, under the banner of what the curators call "choreography." At the center is a colorful model prepared by German-born Conrad Schick, the well-known architect of Jerusalem during the 19th century. He prepared the model in 1862 for the Ottoman sultan and also made two copies of it, one for Queen Victoria and the other, for German Kaiser Wilhelm II. The keys to the site and the honor of opening and closing its doors was conferred many decades ago on two Moslem families – the Nusseibeh and Joudeh clans. Schick's model shows how the church has been subdivided among the different communities and denominations: Greek Orthodox, Catholics, Armenians, Copts and Syriac Orthodox. It is quite clear that this division is not egalitarian, and actually quite random. “Maybe if one of the churches had paid Schick more," muses Coen-Uzzieli, "the division would have been different, but this model is the most concrete example of the status quo. It shows that one can conduct matters in a pleasant way even though the status quo is fragile, with priests coming to blows quite easily.” She notes that among other incidents, in 2008, Greek Orthodox and Armenian worshippers fought with each other over the holy site. On the wall along the stairway leading upstairs in the Israel pavilion, an animated film by Israeli illustrator David Polonsky is being screened. 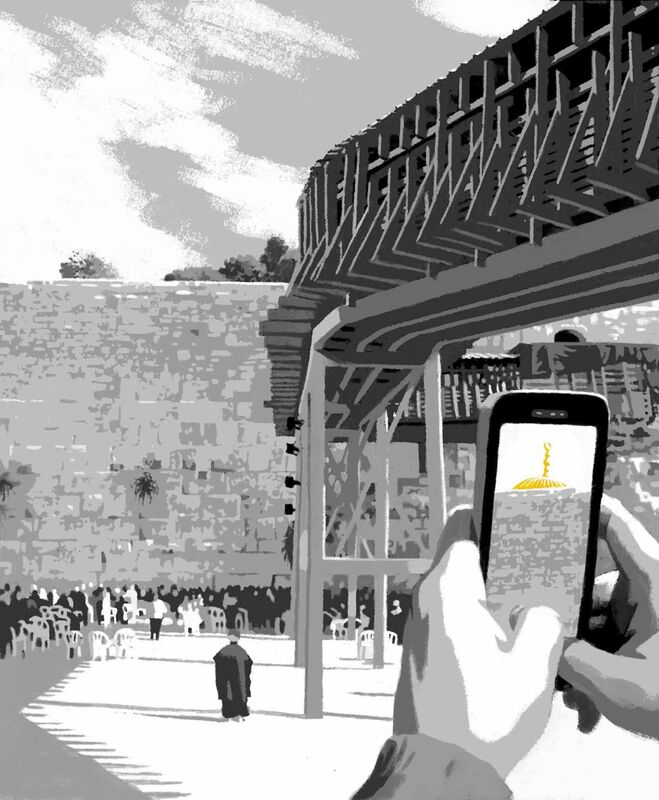 It shows the Mughrabi bridge, leading up to the Temple Mount from the Western Wall – the only entry route for non-Moslem visitors to the compound, which is holy to all three major monotheistic religions. Previously there had been an earth ramp there, constructed on top of the last remaining house in what was once the Mughrabi Quarter of the Old City. In 2005, after the ramp collapsed, the Israeli government decided to construct the bridge, ostensibly as a temporary structure since it violated the status quo on the sacred Mount. On the upper floor of the pavilion are three fascinating sections. 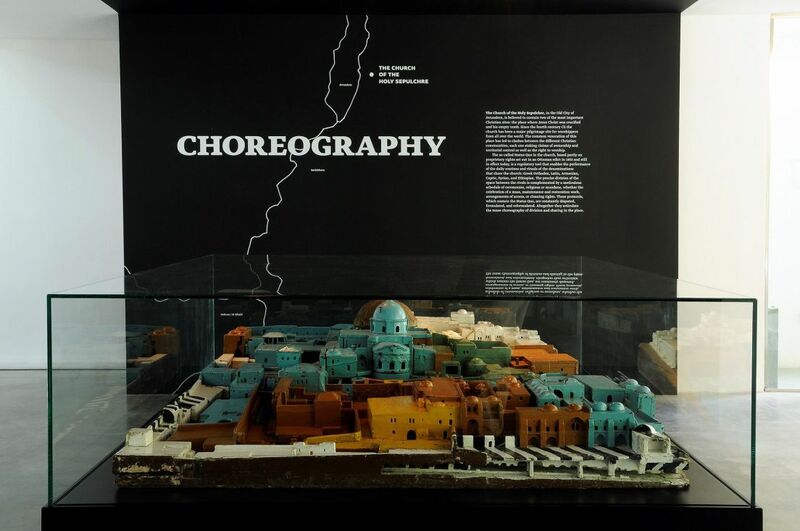 The central area, entitled "Project," shows models for expanding the Western Wall, created over the last 50 years. One is less a design proposal and more a form of documentation of the site, on the eve of the Six-Day War. The Mughrabi Quarter was still intact then and the alleyway next to the wall was just a few meters wide. The neighborhood was razed in the days following the June 1967 war. 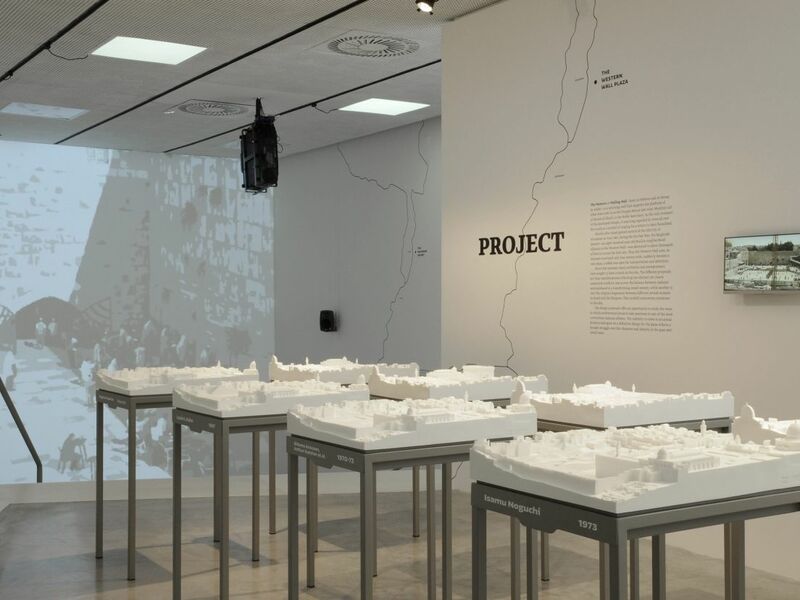 This exhibition constitutes what may be the most concrete expression of the demolition of the quarter ever created by Israeli architects or academics, on a topic about which much has been written. Another expression of the destruction wrought there appears in two photos that appear in the catalog published to accompany the exhibition. One comes from the 1929 Matson (G. Eric and Edith) Photograph Collection, showing a group of Jews looking at the wall and crowded neighborhood abutting it. The next page features an image by the famous David Rubinger, showing a tractor carrying out the demolition. Finkelman points to a photo of another document – the demolition order itself, signed by architect Arieh Sharon. The models and exhibits on display differ from each other according to the year in which they were created, the style of the architects involved and the individual or organization requisitioning the proposals. These included the Ministry of Religious Affairs, the Jerusalem Municipality and even the Israel Museum. 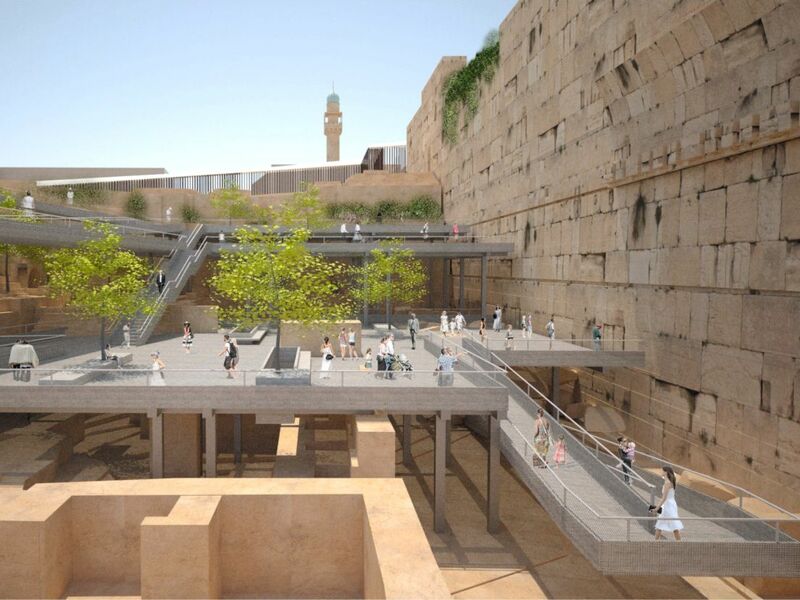 One proposal for the large expanse of the plaza was created by architects Shlomo Aronson and Arthur Kutcher, together with three consultants and under the supervision of architect Yosef Shenberger, an adviser to the minister of religious affairs. This wasn’t a blueprint per se, but more an architectural analysis of the site. Thus, for example, they presented an illustration of the Mughrabi Quarter as compared to St. Mark's Square in Venice, also offering a perspective of the Old City neighborhood in relation to the Dome of the Rock, looming above it. The most operational proposal was submitted by renowned Israeli-Canadian architect Moshe Safdie, a rising star in Jerusalem at that time. 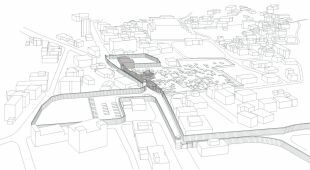 He was invited to come up with ideas for the Western Wall plaza by the Jerusalem Municipality and the East Jerusalem Development Corporation. Safdie produced a number of plans for the plaza between 1974 and 1985, and initially proposed creation of an area that sloped down toward the Western Wall and was divided into levels, including shops and markets. Another scheme for the site, and the only one calling for its destruction, came in 1991 from a Likud party activist, Amos Orkan – who envisioned construction of the Third Temple there, a short distance away from what is thought to be the original site of the ancient temples. The newest proposal for revamping the site comes from Israeli-American architect Michael Arad, who designed the World Trade Center Memorial for the victims of 9/11 in New York City. Following a request by Prime Minister Benjamin Netanyahu, Arad began to draw up his proposal in 2014. This came after a suggestion was mooted to create a prayer area for women at the wall, at the archaeological site surrounding Robinson’s Arch, to the south, after those seeking a solution to egalitarian worship rejected a proposal by Education Minister Naftali Bennett. Arad suggested creating several levels, with ramps and landscaped expanses, including an area 80 meters long in which women could pray. Curator Finkelman notes that the area immediately surrounding the wall is rife with conflicting interests not just due to religious concerns, but due to archaeological ones as well. Arad's proposal was never presented to the public and the Biennale offers the first opportunity to see it. Another section of the Israeli exhibition, called “Landscape,” relates to Rachel's Tomb, the final resting place of the biblical matriarch. It reflects the extreme changes the site has undergone, from the time it was documented in iconic 1890s photos to its current situation as an Israeli-controlled enclave, surrounded by walls, inside Palestinian territory. 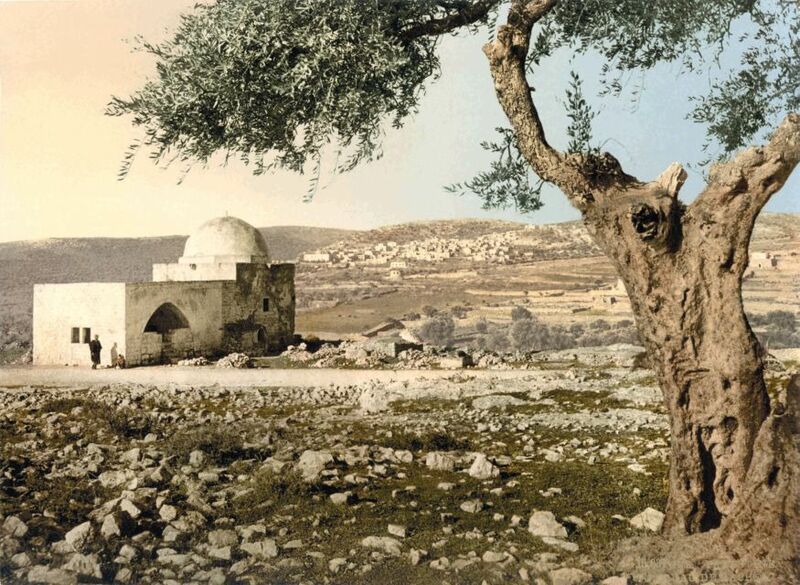 A film screened here documents the changes at the tomb, which began before 1967 when the nearby city of Bethlehem began to expand. The most significant developments came after the Oslo Accords when violent incidents occurred at the tomb, following which architect Israeli Yaron Katz designed a security corridor encompassing it. 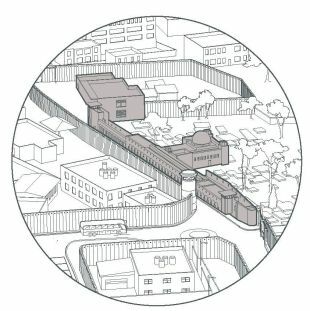 Another significant step was the building of the separation barrier, a particularly complex task at this particular location along the route of the huge concrete wall slashing through much of the West Bank. The exhibition catalog contains many photos and sketches showing changes at the tomb, which is holy to all three religions, and along the barrier with its guard towers – images that were ostensibly created as a form of objective documentation but are actually quite critical. Also on display in this section is a painting of the pregnant Virgin Mary, created by a British priest and artist at the request of nuns from the Emmanuel Convent in Bethlehem. The painting, the curator explains, is a symbol of struggle and a popular pilgrimage site. Why did she and her colleagues choose to define this part of the exhibition “landscape?” “The tomb is a landscape in-the-making. Political events and the growing city have shaped and still shape the constantly changing surroundings here,” she replies. The last section in the pavilion deals with the Tomb of the Patriarchs and is entitled “Scene.” In 1967 it was decided that the Hebron site would be open to both Jews and Moslems. However, following several incidents – in particular the 1994 massacre there of 29 Moslem worshippers by Baruch Goldstein, and the recommendations of the commission that investigated it – the Israeli government hermetically separated the Jewish prayer area from the Moslem one at the site. For 10 days a year only Jews are allowed to pray there; during another period of 10 days, it is open only to Moslems. A 2012 film by Nira Pereg shows the transitions at the site – how chairs and carpets and the holy arks of the Jewish synagogue there are removed, under the watchful eyes of Israeli soldiers, at different times depending on who is worshipping there. “It’s almost like theater," says Finkelman. The catalog accompanying the Biennale features commissioned essays by writers in different disciplines, and includes reprints of some canonical articles such as a scathing attack on the veneration of the Western Wall by Prof. Yeshayahu Leibowitz and selections from Mark Twain’s famous 1869 work, "The Innocents Abroad."